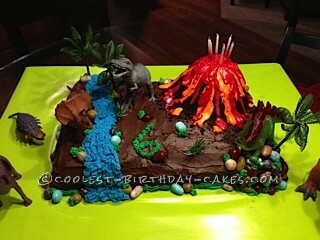 I started out this Jurassic scene birthday cake by baking 2 large square cakes. One was chocolate and one yellow to add some more options (Dunkin Hines, I think, is the best). Iced it with creamy chocolate icing. Then, for the volcano I purchased a Barbie doll cake (the kind where the cake is the Barbie’s dress and there’s a little Barbie head and body sticking out of the top). Placed that on the corner of cake without icing. Ground up Oreo cookies and sprinkled around the bottom of the volcano to make it blend a little better. Made icing out of Wilton’s icing and orange food coloring and added water to make it runnier, then poured on volcano using a spoon. Then, bought red shimmer icing. Melted and poured over the orange icing. The shimmer icing looked awesome, looked just like lava. For the river, I made the blue icing with the Wilton’s icing and blue food coloring. Found a tip I liked and tried to make it as wavy as possible. With water, you really can’t go wrong. Then, put some candy rocks throughout the cake and made a little rock corner to spice it up a bit. Added some touches of green for bushes or grass. Then placed plastic dinosaurs and trees. could you please tell me where i can get the shimmer icing, I am from Morganton N.C. thanks for your help!